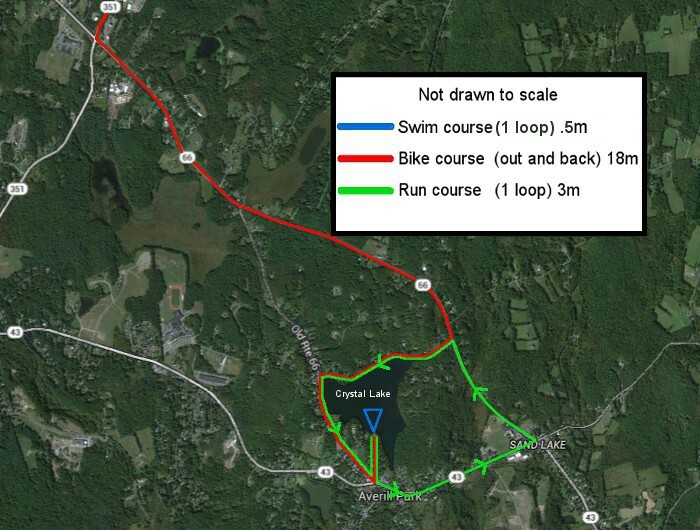 The swim will be a triangular course in the calm waters of Crystal Lake. 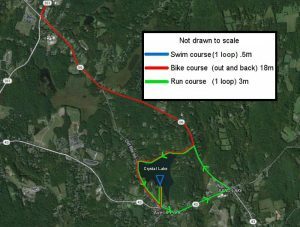 Out & back bike course. Exit the transition area onto the road up the hill and go right onto Old Route 66 past St Henry’s Church and go straight for ~0.1 mile then turn right onto Crystal Lake Road. Continue on Crystal Lake Road for ~0.5 mi and take a left at the stop sign onto Route 66. Continue of Route 66 for ~2mi and take a right onto Route 351 at the light. Continue on Route 351 through the flashing stop light until you get to White Church Road at mile 9, this is the turn around. Caution must be used at this and all turns. Return to Crystal Lake following the same route back.